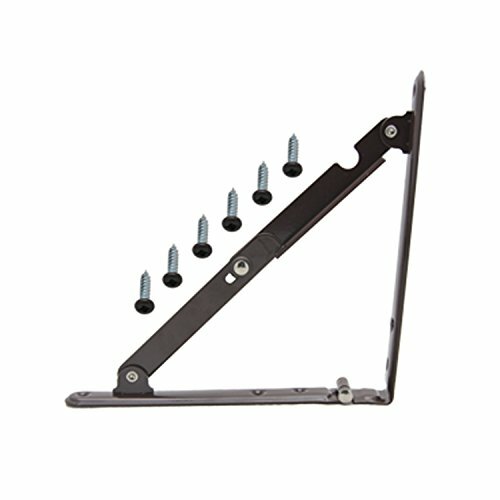 8"x 8" Universal folding steel shelf bracket. Provides sturdy support for numerous types of fold down shelves, folding tables, and work surfaces or anywhere a foldaway shelf is required. Can also be used for TV mounts or kitchen counter extensions. Able to support up to 50 lbs. Able to support up to 50 lbs. If you have any questions about this product by AP Products, contact us by completing and submitting the form below. If you are looking for a specif part number, please include it with your message. NACH Qa-1032 Diy Industrial Style Asymmetrical Silver Brushed Black Pipe and Single Rustic Modern Wood up Down Shelf, 24" x 9.8"
32" Floating Shelf Heavy Duty Solid Steel Bracket- For 36" + Shelves MADE IN THE USA!